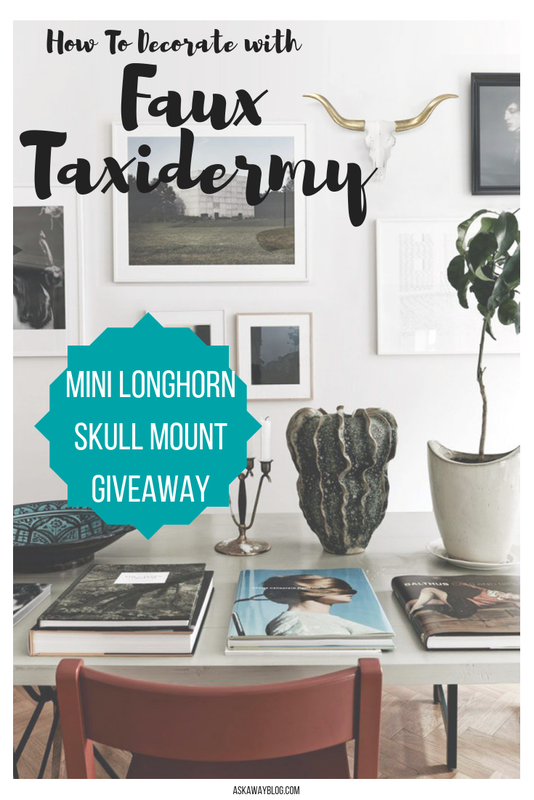 Ask Away Blog: How To Decorate with Faux Taxidermy + A GIVEAWAY! 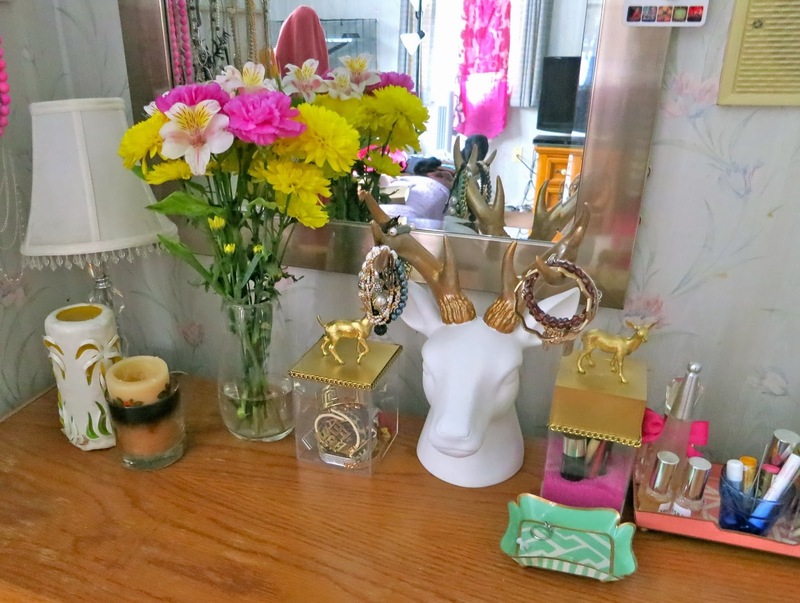 The first thing people say when they enter my home is usually "Wow, you really love deer antlers." Why, yes I do but they're all faux. I love the look of antlers and I love the look of faux taxidermy whether it's a head or a skull. I think it's a very boho chic way to decorate my home. I also consider it a very animal friendly way to decorate since I'm obviously not using REAL animals. If you want to embrace the idea of decorating your walls with faux taxidermy, read on and make sure you enter the AMAZING GIVEAWAY at the end! A couple years ago I found a really fun way to do a "mixed media" art display of my own. 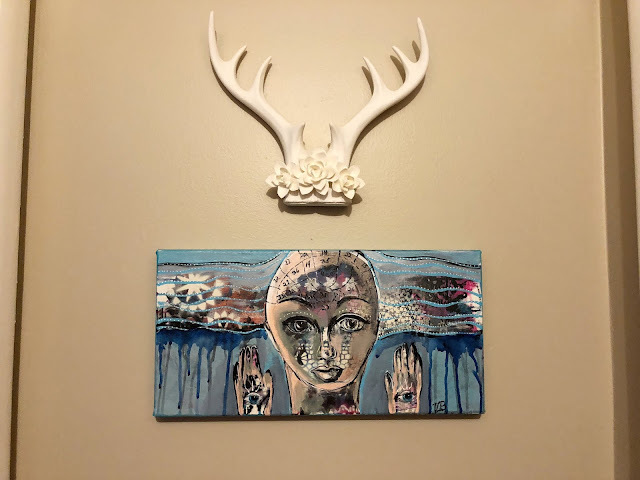 I took a painting I purchased from a local artist and hung it in my hallway. It was a smaller size with a longer width so I wanted something to balance it out. I found a small antler/floral decor piece and realized it was perfect. By hanging it just over top the painting, it almost looks like the head on the canvas has antlers! I may eventually make this a mini gallery wall so I will have to find some other items that will make a nice scene on the wall. 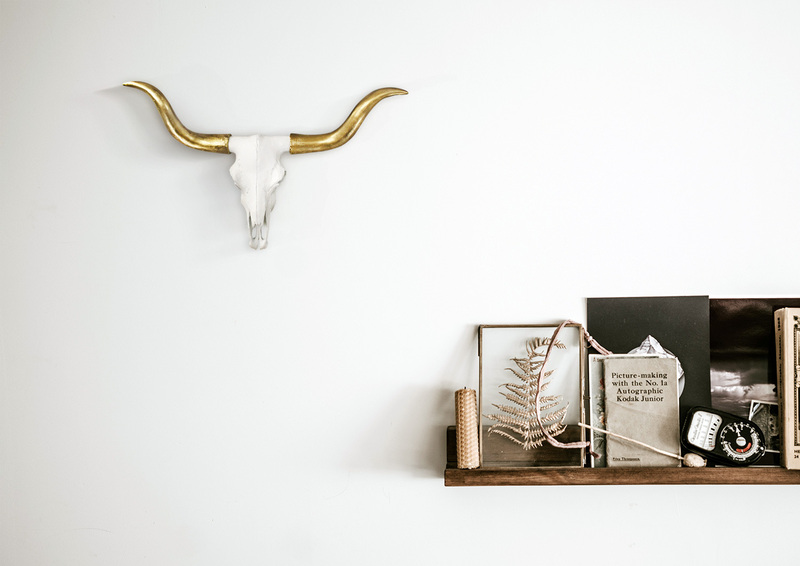 Animal heads, especially ones with antlers, make a BEAUTIFUL piece of decor but also a practical way to organize and hold items. This is especially true with jewelry. I've seen people hang a deer head on the wall and then use it to drape scarves, necklaces, and even belts. The key is to make sure you have a sturdy piece that can hold whatever you place on it. I even kept up with the deer theme by using make up and jewelry storage cubes with a gold deer on top! 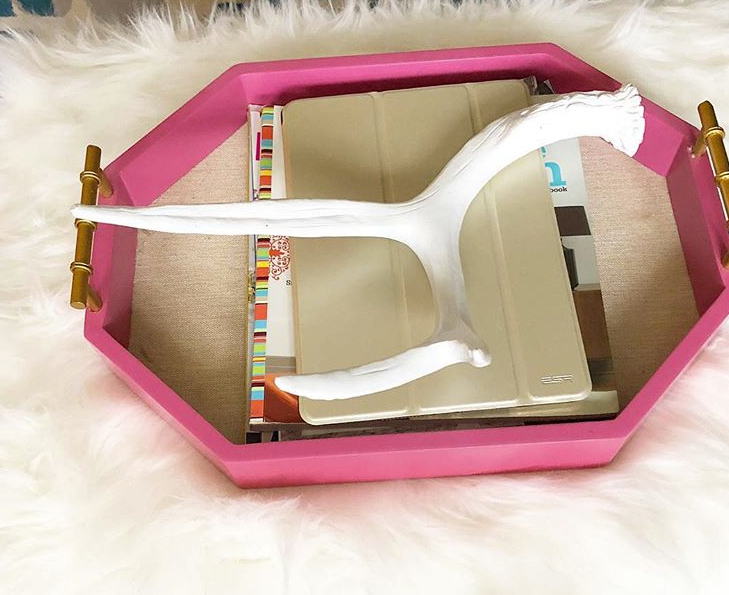 There are ones that stand on a surface, ones you can hang, and I have even seen people use faux antlers as coat hooks in their entryway. It's so brilliant and you know I'm all about anything that doubles as practical AND glamorous! 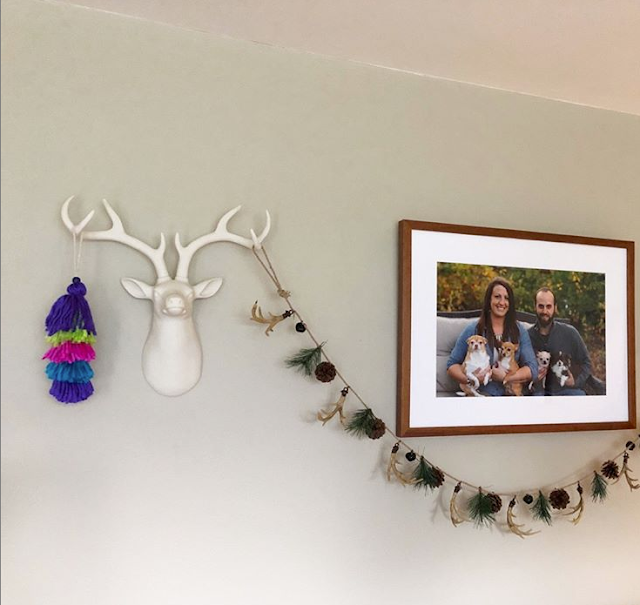 I especially love using faux animal heads as a somewhat balanced border around another piece of decor like a photo frame. On my one wall in the living room I have 2 deer heads next to the framed photo of me, James, and the dogs. The best part is that at Christmas and in the Fall I can decorate their antlers! So not only can this look great around a framed photo but you can use it to hang seasonal decor without making any new holes in the walls! 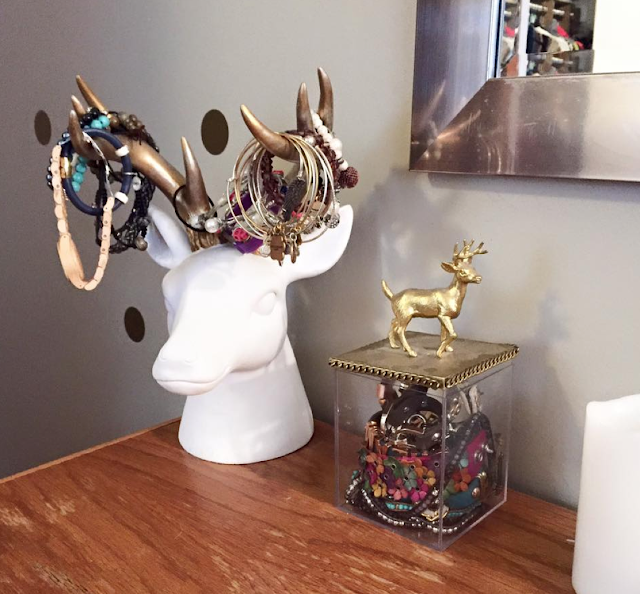 Another way I use faux taxidermy around my home is by using simple antlers as table top decor. Sometimes I lay them on a random bookshelf, around a vase in the center of the dining room table, or just on the coffee table tray. You can also use standalone faux animal figurines to keep up with the theme in your home. I love to use deer statues at Christmas and I put them all over the house. While I love silver and gold, I really love bright fun colors! 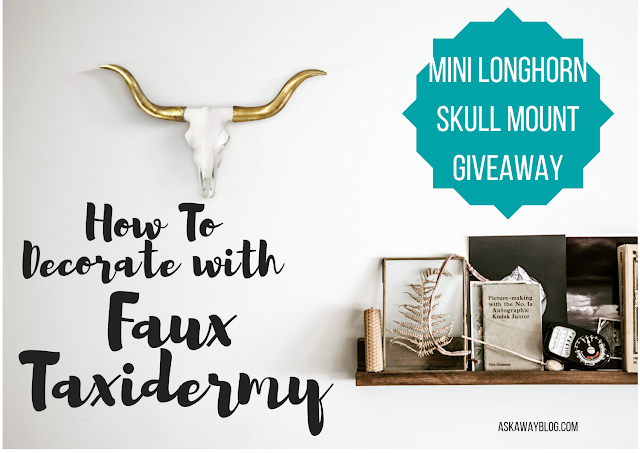 My favorite way to display a larger faux skull or animal head is by having it be the only 3D item on a wall but still on display with other decor. The long wall in my dining room is perfect for this, as aside from the Buddha canvas, it's only got vinyl wall decals to compete with. This really helps add some dimension to an otherwise dull and boring wall. I bet you're wondering what the heck a Wall Charmer is by now aren't ya? 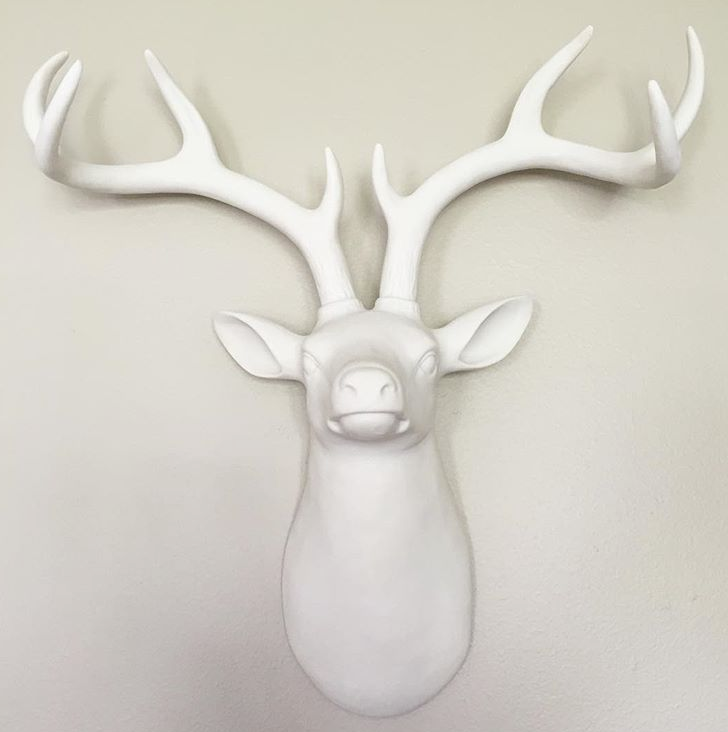 Well, each faux taxidermy wall mount is custom made and custom painted to order and is cast in a fine lightweight resin. When you order a Wall Charmer mount like the one I have, it comes with the horns off. You just have to superglue them on and let them dry and then you can hang your mount. Each piece has a keyhole in the back for you to use hardware to hang. The attention to detail in this skull is SO impressive. There are all kinds of animals to choose from and not just skulls. They have actual faux animal heads like deer and horses. They are fun for a kid's room. Today, Wall Charmers is giving one lucky Ask Away reader a Mini Longhorn Skull in white and gold! This is such a beautiful piece of art!! I can come up with so many ideas that I would switch it up and use in every room of my home, depending on the season and my mood. Right? I freakin love it!!!! Your house is decorated so beautiful. Aw thank you so much amy! I would give this to my uncle for his lake cabin. He would love it. I really love this piece and could use it in several places in my home, but I would probably put it over the mantle. I'd put it in the living room. I would put it in the kitchen. I would put it in the living room. It would give the whole room such a unique and one of a kind look to it!